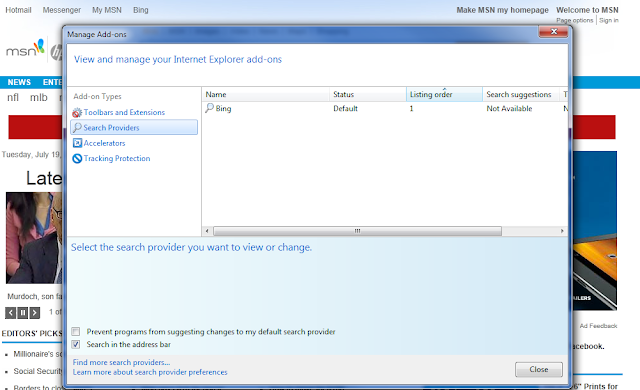 DearMYRTLE's Genealogy Blog: IE and Bing: Microsoft trying to regain market share? IE and Bing: Microsoft trying to regain market share? Following the installation of Google Chrome, making it my default browser and setting Google as my default search engine, Ol' Myrt here had to jump through all sorts of hoops today to retain that preference the next time I opened Microsoft's Internet Explorer. It would appear that my Internet Explorer (version 9.0.1) really and truly wants to be my default browser (not!) and pushes Bing as my default home page (not!) and default search engine (arrgh). WHY is Ol' Myrt using Internet Explorer? Quite simply because viewing Ancestry.com digital images works better with IE. My DearREADERS, mostly intrepid genealogy researchers, will likely encounter the same problem, so I'll take you through those hoops. Guess Microsoft thinks we need more keyboard and mouse exercises, eh? Silly Microsoft. First silly message from IE. From this screen shot I am lead to wonder just what program in Microsoft's estimation had "corrupted your default search provider setting for Internet Explorer" Well, remember, I had just installed Chrome 5 minutes earlier on this machine and set Google as my default search provider as is my preference. But that wasn't corrupting my file, it was setting my preferences. Really now, Microsoft! Check out that second line that says "Internet Explorer has reset this setting to your original search provider, Bing." Really now? MY original? How about telling it like it is, Microsoft? Bing has never been my original choice. Bing is merely the default when IE came pre-installed on this computer. And every time I receive an update, IE has reverted back to the setting where Bing is my home page and default browser and default search engine. 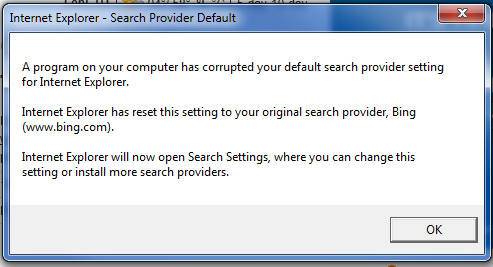 Consequently, each time IE updates, I have to reset the default settings to my preference for Google. It is no consolation that the dialog box states IE will "now open Search Settings, where I can change this setting or install more search providers." IE should not have changed my choice made five minutes earlier, nor should Microsoft use inflammatory words like "corrupted" to describe my choice to use "another program" Google Chrome. Inflammatory words can upset folks, especially mild mannered genealogists. OK, that being said, I clicked the X, to get out of the false warning dialog box, but found the "X" didn't exit, but acted the same as if I had clicked the OK button. Bad form, Microsoft. Here is the second screen shot where I blissfully removed Bing as my default search provider and added Google as my preference. Me thought clicking "close" would close the matter altogether, but no! Silly me. Ol' Myrt was then taken to a page on the Internet (screen shot below), probably the last one I had visited prior to opening IE for this hoop jumping today. Now really, Microsoft. You know that people look at the top of the screen. You are hoping that folks will miss that little message across the bottom of the screen that reads "Would you like to make Internet Explorer your default browser? Yes or No." After the hoops you've jumped me through today, I wonder what ignoring that will do to my preferences? Ol' Myrt here noticed the "down arrow" button to the right of the "No" button where I was offered a way out of the hoop loop by selecting "Don't ask again." I won't be holding my breath. Wonder what will happen if I install Safari? All I can say is that with all this hoop jumping, it is obvious Microsoft is desperately attempting to regain market share. Instead of winning me back, Microsoft wasted my time and made me mad. The only think I'll jump for is JOY when Microsoft quits such pervasive practices. Maybe next time around, I should get a Mac? Maybe you SHOULD get a Mac! 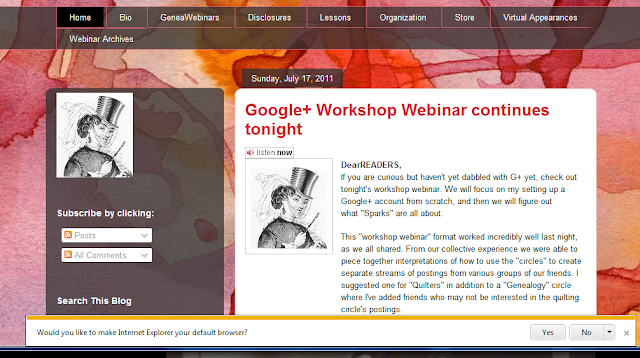 More seriously, I was fairly tired when I managed to check into the second half of the Google+ Webinar last night, but I think I remember that the division between Mac and PC was pretty close to equal with the PC having the lead. This is a closer ownership than many people would have us believe. My computers have all come from Apple (first the Apple II and then the Macintosh) BECAUSE THAT IS WHAT THE COMPANIES I WORKED FOR USED! When I was retired I stayed with the computers I was accustomed to and which met all of my needs. And that is what each computer user should do. I use a PC on which I have installed LINUX along with a M$ partition. I only use the M$ for Legacy, my genealogy software of choice. I use the LINUX for Open Office, Firefox, GIMP and the other open ans free software that I need. I don't have to pt up with the M$ errrrr "stuff"
I am surprised that ancestry.com works better on IE for you. That is one of the main reasons I switched from IE--it would get hung up every time I was in ancestry.com. Thanks for sharing your experience and I am sorry for all your frustrations!